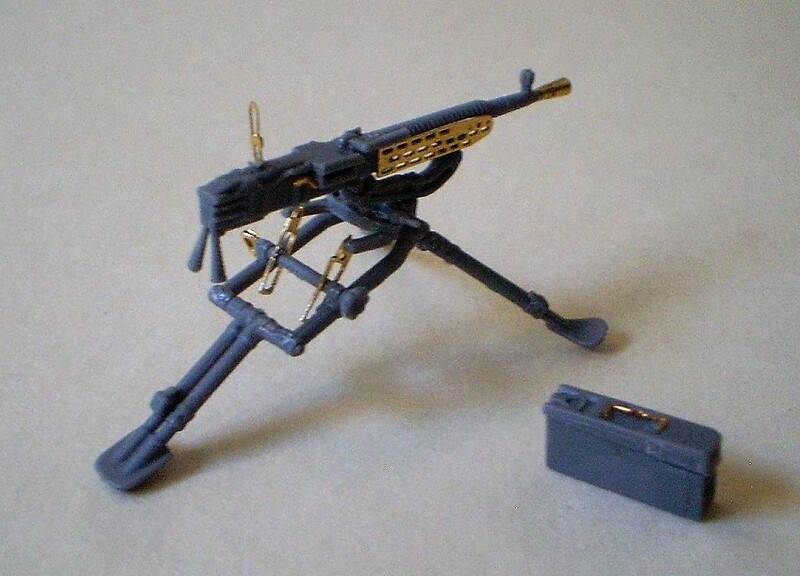 One of the latest entries into MiniArt Models line of WWII Military Miniatures is a German Machine Guns set. There is enough styrene in the box to build two MG 34's, two MG 42's and one ZB 53. The ZB 53 was a Czech design and were from captured stocks after the German Army invaded Czechoslovakia at the beginning of WWII. The Germans later changed the designation to MG 37. All of these weapons utilized 7.92x57 ammunition. Fun Fact: The MG 42, although redesigned and improved, is still in service as the MG 3. Along with the machine guns there are parts for ammo cans, barrel canisters, and ammunition belts. MiniArt thoughtfully includes photoetch bits for the carrying straps/slings of each gun, handles for the ammo cans, and the cooling vanes/heat shields on the barrel of the ZB 53. All in all, you get 84 pieces of plastic and 38 photoetch bits. I found assembling those slings fiddly but on reflection a better in scale method eludes this author. Be sure and hang on to the box as the assembly instructions are printed on the back. The instructions include a painting guide with a chart listing all the paint manufacturers on the planet and their matching colors. Well, most of the major manufacturer's at any rate. There is the odd glitch, here and there, with the instructions. For instance, on the diagram for the MG-34, part A6 is listed twice. One A6 is the side of the ammo canister, the other A6 (actually A2) spans the gap across the top of the canister. It's not hard to figure out but still.... The breach cover for both the MG-34 and MG-42 are provided as separate parts. You also have the option of either folded bi-pod or an extended one with each gun. The cocking handle for the MG-42 is an individual part. MiniArt also furnishes a styrene ammo belt for each weapon. Neato! The tripod for the ZB 53 has more than it's fair share of those small parts. MiniArt has included a photoetch part for the muzzle of the ZB 53. You will need to exercise some caution when rolling it out. I would have preferred a plastic one but that would be have been way out of scale. MiniArt does include two photo etch parts for the muzzle, on the oft chance that you mess one up. Practice does makes perfect! Glitch number two with the assembly diagram involves the ZB-53. There are some tightening handles on the tripod that are labeled as part Af 3, they are actually Af 17. You do get optional legs (extended or not) for the tripod. Assembly isn't that much of a chore, but with all the small parts building these machine guns will require some patience, and a keen eye for when some of those itty bitty parts go flinging off into the infinite. All in all the minute detail does add to some exquisite German machine guns. 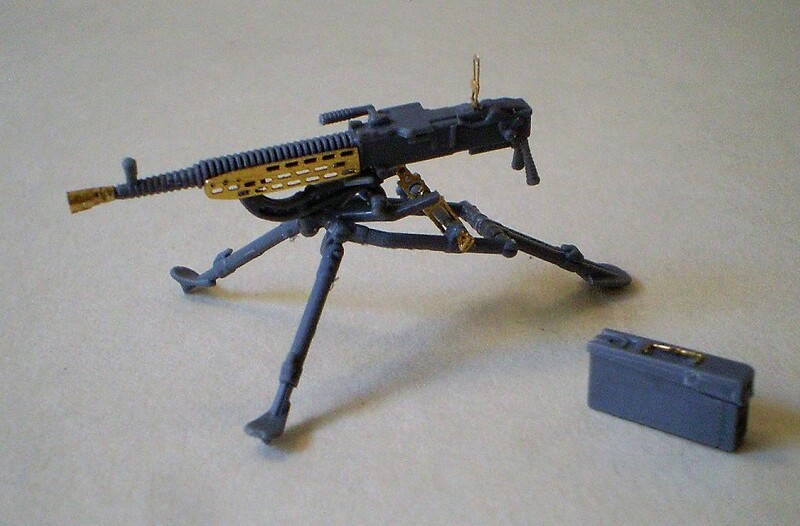 Use for these German machine guns from MiniArt guns is pretty evident. They will add to the realism of any scene or kit you choose. The addition of ammo cans and other sorted paraphernalia for these machine guns is nice touch. You could even combine these German Machine Guns with MiniArt's German Soldiers figure set ( #35218) and have yourself a nice vignette. They will also make an excellent obligatory companion piece for the Modelkasten figure set of machine gun girls. My thanks to MiniArt Models for the review copy.